Before St. Joseph's Academy (SJA) has become what it is today, all concrete from bottom up, there was a brown patch of land by the main gate, beside the National Shrine of Saint Joseph (formerly St. Joseph Parish). It was small but big enough for about 20 to 30 children to run around and play catch in. Thinking about it now, I'm sure it was meant to be a garden with a statue in the middle and trees surrounding it. The slender trees, thick with dark bark and coated with ground dust, stood bent and drooping, like a decreasing army of wounded soldiers. A bit of trimmed grass, parlored bushes and a keep off sign would have made that piece of land a peaceful sanctuary in the middle of a bustling city, a modest remake of the garden of Gethsemane, something you would expect from the ICM Sisters who managed the school in its early years. But there was no stopping us, still young and jaunty schoolchildren at the time, from entering this well-shaded garden whose mere presence unceasingly taunted us to play. Dust rose from the ground as we chased each other in this garden during class breaks and at the end of the school day. We were oblivious to the health hazards the garden posed on us: dusty air that was as thick as the bark of the trees, undried sweat on the back of our white cotton uniforms,and the verbal onslaught of mothers who thought more about laundry than the benefits of play. The iron-fenced garden was just beside the walkway toward the main gate. Parents who waited by the entrance to pick up their children could see us running, laughing, and shouting in this small patch of land. Here, no parents, guardians, and teachers could extend their hands to grab us and make us give in to quiet restraint and proper behavior until we want to. We even left our bags somewhere along the cemented main walkway, ignorant of thieving acts and their consequences. In this small garden, we were resourceful. Some groups, mostly boys, played catch or "Japanese-Japanese". My group of girls often played Chinese garter. It was a rage during my elementary years. Anyone could buy a garter from the vendors just outside the gate. It came in different colors and thickness. When a garter broke up, we simply reconnected it and continued playing. If we became bored with it, we played another game, maybe skipping rope or piko. Others regularly hang out by the guava trees for a long time until they became attractive to til-as (woolly bear caterpillar), like what Ferliza Contratista, an SJA alumna and now an information officer of the Philippine Information Agency-Region 7, did with her best friend Elaine Bathan, now a lawyer. It was also Ferliza who shared a memory with me about a classic Volkswagen Beetle belonging to the ICM Sisters parked in the garden, which I must have missed. For my part, one of my playmates I remember so well was Fatima. She was tall, willowy and thin. She had short fair hair and fair skin, like a foreigner. Sometimes, she pouted her mouth when she talked. I remember feeling a sense of dissonance when I talked to her in Cebuano while I looked at her wan face. I also remember feeling a sense of appreciation as I watched her jump and stretch her long legs to reach the highest level of the garter. Her hips twisted, her below-the-ear hair shimmied, her dark blue uniform skirt reeled. It was a whirlwind maneuver: one foot is stomped on the ground as the other leg reached for the garter, then both feet are raised to cross over the thin line of the rubber before landing on the ground on the opposite side of the court. The trick is to extend the raised leg as high as possible to ensure that the garter is caught and, once done, to never let it go. Sometimes, the dust of the garden rose with us at every jump, blurring our vision of the garter. Other times, the spaces in between leaves and branches of the trees let in a penetrating light, blinding us from seeing our aim. It was a simple and fun game of how far you can go and how far you can reach, given the restricted use of body parts and the rough landscape. But Fatima was talented. She succeeded in jumping over the garter many times over and we, her team, were exhilarated with every success. She failed, too, at times, and we would be quiet with disappointment. This is not to say we were very competitive but we were competitive enough to be sad when a partner or teammate failed to "save" the rest of us. The sounds of the garden were not all play-induced glee. The trees were witnesses to how children socialized. When we won, we exchange high fives with each other, even with those who were not even nodding acquaintances in the classroom. When we lost, the trees became validators to how some pushed each other with a deafening exchange of blames and insults, only to end in a friendly placement of arms over shoulders and in laughter as if nothing happened. During the first month of the school year, at the tail end of summer, when the weather was still normal, the ground of the garden would still be cracked dry. It became the landing area for bruises and scrapes. The garden also turned into an exploration space for our Science class. When the rains came and the ground soil became mud, no one dared to waddle across the yard. With no one around, the tiny landscape turned mysterious, if not eerie. This is what I remember of the garden of St. Joseph's Academy in Mandaue City and the children who got the chance to play in it. I have now lost my opportunity to revisit the place and wax poetry from the trees and the soil because it is no longer there. A tall building of necessity now stands where the garden was, all light blue concrete, to provide additional classrooms and facilities for the students and teachers. 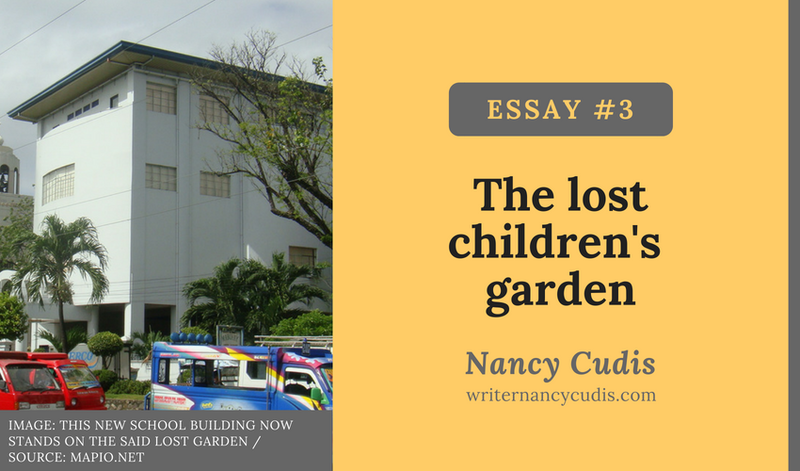 When I pass by the school on rare occasions on my way to the city hall or from the dentist to the North Reclamation Area, I can see this building but I will always remember the garden.